Hi guys, please could you tell me what size nozzle will be suitable for a 14mm rolaball table please, Thanks. 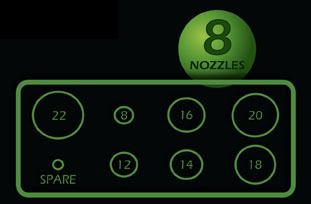 Please check above in the product description for a list of nozzles and sizes (they are in mm). The push rod tat pumps the base mix through the gun is released by depressing the small lever at the top of the Sausage Gun, and then using eth T Bar the plunger can be pulled straight back. The advice related to putting your foot on the bar is really only for when the plunger is difficult to withdraw, and as such a last resort. If you find that the plunger is sticking it is definitely worth smearing a very light coating of oil (fish oil of your making fish meal baits, or vegetable oil for other bases like bird foods) around the inside of the barrel, as this will normally help everything slide a little more smoothly.